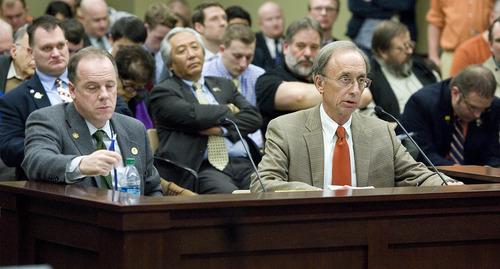 Gun rights • Two hearings, two passes on bill that would put Utah laws above the federal rules. Another committee hearing resulted in another misfire Friday for Rep. Brian Greene&apos;s bill that would seek to have state firearms laws trump federal gun laws. Greene, a newly elected Republican from Pleasant Grove, was visibly frustrated by the delay and said it would be up to House Judiciary Committee Chairman Kay McIff, R-Richfield, to determine when it might get another hearing. When asked what he thought about the bill missing a vote for the second time  the committee ran out of time and had to adjourn before taking action  Greene said he wouldn&apos;t be commenting. 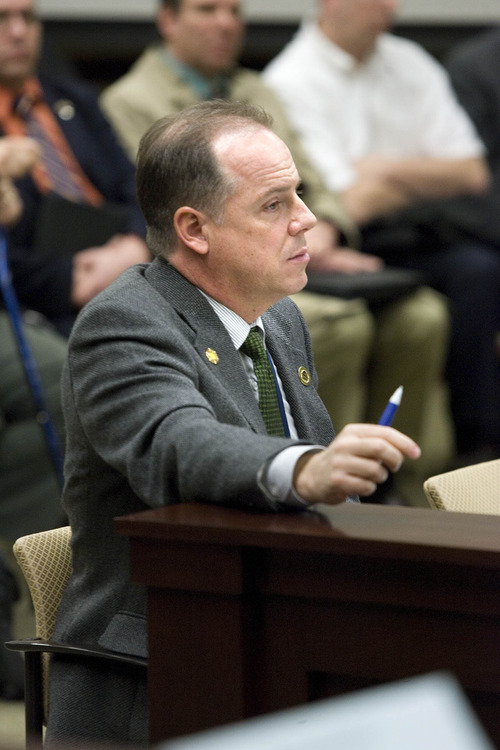 The bill was also heard Wednesday in committee but failed to get a vote when Rep. Brian King, D-Salt Lake City, made a motion to adjourn as time ran out in that meeting. At stake for Greene is HB114, which is one of the more ambitious firearms proposals that drew fire from opponents due to a long, legal analysis by legislative lawyers that cautioned it would be ripe for being struck down for violating both the supremacy and commerce clauses in the U.S. Constitution. The measure achieved notoriety for a provision that would grant local sheriffs the authority to arrest federal agents attempting to seize firearms from Utah residents  deeming that act a felony. It was amended to remove the felony charge. 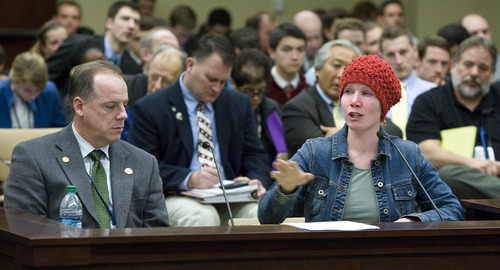 During public comments Friday, lawmakers heard testimony ranging from a woman tearfully reading a poem to show her support for Greene&apos;s measure to longtime supporter of tighter firearms control Steve Gunn. "This bill rejects the rule of law," Gunn said. "And you should reject this bill." 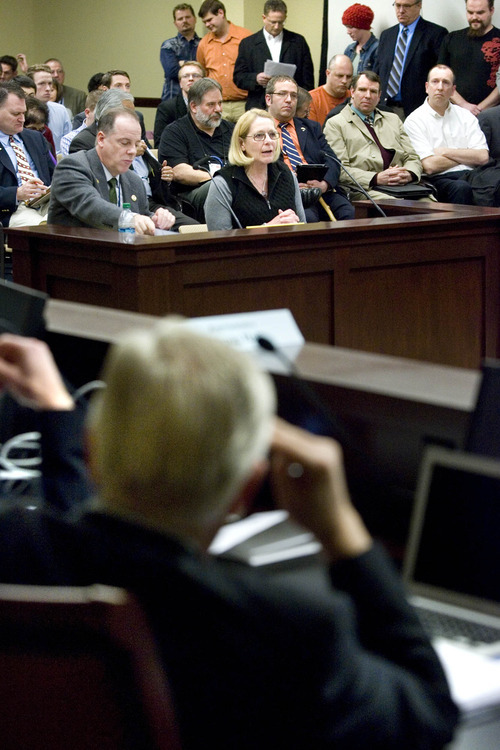 Although the room was packed for the early morning hearing, it lacked the drama of Wednesday  so-called "Gun Day"  when the Legislature passed four gun bills out of committee. Those included a measure that would make Utah a "constitutional carry" state and eliminate the need for adults to obtain a permit to carry a concealed firearm. Greene&apos;s measure became a focal point for gun-rights activists and saw a huge swell of support from about 1,500 who stood on the Capitol steps in January at a Gun Appreciation Day rally and heard Greene tell them he was going to introduce the bill. It also hewed closely to a letter signed by 28 members of the Utah Sheriffs&apos; Association that said those locally elected law enforcement officials were willing to "trade their lives" in defense of the Second Amendment. The proposal also largely mirrors proposals in 22 states, according to an analysis by the National Conference of State Legislatures. However, only Wyoming has managed to push such a measure to the House floor for a vote. 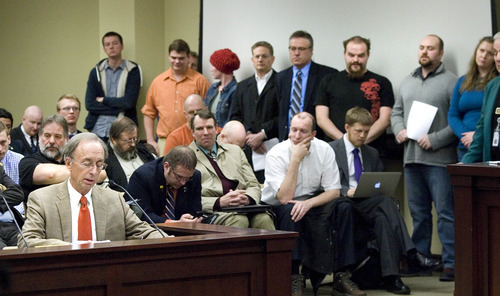 Connor Boyack, president of Libertas Institute of Utah  a Libertarian think tank  said one lawyer&apos;s opinion on the constitutionality of Greene&apos;s measure shouldn&apos;t doom the legislation. "Attorneys disagree all of the time," Boyack said. "By no means is this the law of the land and the interpretation by which the committee should take action." House Speaker Becky Lockhart, R-Provo, said she had lunch with Greene Friday afternoon, but he didn&apos;t bring up his bill with her. She said, however, it was important to get public opinion on the bill before the committee took action on it and didn&apos;t have a quarrel with Perry&apos;s decision to entertain a motion to adjourn minutes before the hearing was scheduled to end so lawmakers could get to the House chamber. "I empower committee chairs to make those decisions and I will back them on those decisions," Lockhart said.